Business Ethics: Decision Making for Personal Integrity & Social Responsibility 3 Edition Business Ethics: Decision-Making for Personal Integrity & Social Responsibility, 3e is designed to prepare the student to apply an ethical decision-making model, not only in the ethics course but throughout her or his business discipline. This model teaches students ethical skills, vocabulary, and tools to apply in everyday business decisions and throughout their business courses. The authors speak in a sophisticated yet accessible manner while teaching the fundamentals of business ethics. Hartman’s professional background in law and her teaching experience in the business curriculum, combined with DesJardins’ background in philosophy and MacDonald’s ability to distill complicated business transactions into understandable terms, results in a broad language, ideal for this approach and market. The authors’ goal is to engage the student by focusing on cases and business scenarios that students already find interesting. Students are then asked to look at the issues from an ethical perspective. Additionally, its focus on AACSB requirements makes it a comprehensive business ethics text for business school courses. 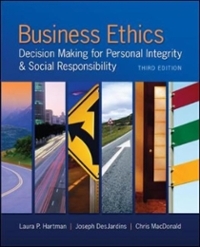 The goal for the third edition is to provide “a comprehensive yet accessible introduction to the ethical issues arising in business.” Hartman and DesJardins have retained the focus on decision-making as well as the emphasis on both personal and policy-level perspectives on ethics. This edition continues to provide pedagogical support throughout the text. The most noticeable changes involve a thorough updating of distinct items such as Reality Checks, Decision Points, and readings to reflect new cases, examples and data.